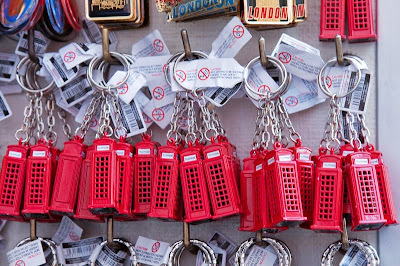 Literally tens of millions of London souvenirs are sold each year. I bet you have one or know someone who does. I have yet to get my hands on one of those! I'd be willing to wager none of them were made in Britain. Just like here. You would win that bet. My Tower Bridge magnet is proudly displayed on my refrigerator door and my Harrod's shopping bags make their way to the grocery with me on many occasions. I want one!!!! Those are so cheerful. The closest to a London souvenir we have is when my in-laws brought back a black taxi car for one of my son's birthdays. It promptly broke. I am wearing a London souvenir right now, a London marathon t-shirt. Hi Many years ago I visited the UK and London and decided it was time to visitMadame Tassuads my sOuvenir were the photos I took in rhe Wax Museum and the memory of Hyde park etc. etc. As a souvenir I decided to carry a handfull of pennies of each amount and until today I have the pence and other coins in my photo album. Best and cheapest souvenir to have. No, don't have any London crapola, but it's a wonderful photo. Mo, I don't know how you do this! what a wonderful eye you have. Love this pic! Yup, I got one, but I didn't get the phone booth one... now that I look at them in your photo, maybe I should've gotten one. Hm hm.. that's amazing but frankly i have a hard time visualizing it... wonder how others think about this.. I love that but it may be a bit bulky don't you think?